We have all experienced the evaporative cooling effect that occurs after exiting a swimming pool on a hot sunny day. It probably did not take long past the initial discovery of cloth for early man to take practical advantage of this physical cooling behavior of water when living in hot and arid regions. 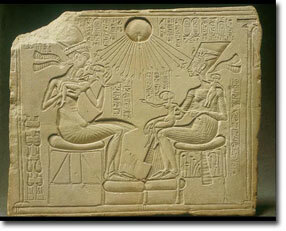 Frescoes or plaster paintings from about 2500 B.C. show slaves fanning jars of water to cool rooms for royalty. The earliest archeological trail of buildings incorporating mechanisms for evaporative space cooling starts in Ancient Egypt with paths spreading quickly to other regions having hot and dry climates. These mechanisms include the use of porous water pots, water ponds, pools, and thin water chutes integrated in various ways into thick walled and shaded enclosures to yield areas that would have been cool and provided an escape from the heat of the day. While it is clear that our ancestors took advantage of evaporative cooling, it wasn't until more recent times that the physics of evaporation and the hydrological cycle were clearly understood so that components and features could be effectively engineered to yield improved and repeatable performance results. 16th Century First Hygrometer Leonardo da Vinci at the beginning of the 16th century was credited with inventing the first hygrometer that used a ball of wool to provide this indication of humidity level. First Mechanical Air Cooler Da Vinci was likely the first to use a mechanical air cooler. This air cooler consisted of a hollow water wheel with an air passage constructed to guide the air from the water wheel to his patron's wife's boudoir. The air was cooled by the splashing and evaporation of water during operation of the water wheel. Motive power was provided to move the air by the water turning a partially submerged wheel. Namely, as sections of the wheel would be submerged into the stream water level moved from the outer edge of wheel toward the center compressing the air in this chamber and forcing it to move through the passages to the boudoir. 17th Century Pascal's Rule for Liquid Pressure Blaise Pascal presented the rule: pressure exerted anywhere on a confined liquid is transmitted unchanged to every portion of the interior and to all the walls of the containing vessel; and is always exerted at right angles to the walls. Boyle's Law Robert Boyle developed one of the four principles that govern performance of evaporative cooling: if the temperature of dry gas is constant, then its volume varies inversely with the pressure exerted on it. 18th Century Fluid Dynamics Bernoulli, Euler, Pitot, Chezy, and others applied the techniques of mathematical physics to develop the science of fluid mechanics. John Dalton established the nature of evaporation, and its importance to the global cycle. 19th Century Flow through Porous Media Darcy (1856) established an understanding and quantitative characterization of flow through porous media. 20th Century Psychrometric Charts Willis Carrier's development of a psychrometric chart similar to ones in use today along with the development of a formula that linked the transformation of sensible heat into latent heat during the adiabatic (no external heat input or output) saturation of air. Settlers of the 1920s and 1930s in the Southwest slept in screened in porches, roofs, or other outside facilities and hung wet sheets to gain some relief from the summer heat. The Arizona Republic reports that guests at the Ford Hotel in Phoenix slept on the balcony while young men peddled to power overhead fans. There were cases of pneumonia during the summer as some wrapped themselves in wet sheets and slept in front of an electric fan. The 1986 edition of Dr. John Watt's Evaporative Air Conditioning Handbook identifies the origins for modern American evaporative cooling as either from the East Coast or Southwest. In the early 1900s, air washers were invented in the East and air coolers were developed in Southwest (Arizona and California). The air washers passed air through water spray, which cleaned and cooled the air in textile mills and factories in New England and the Southern coastline. The Southwestern air coolers included indirect coolers, where air passed over a water-cooled coil, and direct coolers where air was cooled by direct contact with water. The earliest design of the direct coolers consisted of wooden frames covered with wet burlap cloth with fans forcing air into the space being cooled. As they evolved, sumps and recirculating pumps were incorporated into the designs. After a few evaporation passes, scale would form on the pads. To mitigate this, some of the water would be discharged or bled to a drain. Eventually, the design for direct coolers (called wet-boxes, desert coolers, drip coolers, and then swamp coolers) evolved to the common configuration of two-inch excelsior (wood chip or aspen) pads sandwiched between chicken wire and nailed to the cooler frame. The first aspen pad (swamp) cooler was demonstrated in the Adams Hotel in downtown Phoenix June 20, 1916 . In 1939, Martin and Paul Thornburg published mimeographed instructions, "Cooling for the Arizona Home." The two professors at the University of Arizona had conducted tests to improve performance of these direct evaporative coolers. About that time, early mass production of evaporative coolers began as the integrated motor and fan units manufactured by Emerson Electric Company became available. Among the very first of these mass produced coolers were from Goettle Brothers Inc. By 1939, most houses and businesses in the hot and arid southwest were using drip coolers. By the early 1950s, a large number of manufactures had joined the market and were producing coolers for a market that covered much of the USA, Canada, and offshore to countries such as Australia. Cooling for commercial applications requires large airflow rates. Early attempts incorporated larger pads and replaced the water drip application systems with slinger wheels, spray systems, or rotary pads. This step was necessary since drip systems distributed water poorly. This condition existed in small coolers limiting their performance and was amplified in larger pads. In the slinger wheel configuration, a partially submerged, rotating wheel produces a sheet of water in the plane of the wheel. Evaporation takes place as air moves through this sheet of water and in the pads where the un-evaporated water is caught. It was quickly found that slingers were not the answer. The problem with slingers is that the density of the airborne water created by the slinger varies inversely with the square of the distance from the center of the slinger plate. This variation is further disturbed as the air stream collides with the water dependent on slinger rotation speed, direction, and the air velocity profile. Similarly, spray systems suffer from variation in physical nozzle coverage and alignment, water pressure over time, nozzle erosion, nozzle clogging, and non-uniform air stream air velocity profile. Each of these systems failed to achieve desired air and water distribution to effectively wet the pads uniformly. Areas of the pad that are not wetted effectively allow air to pass through without being cooled and at the edges between wetted and un-wetted surface establish sites for scale formation. Pad Sagging The uneven shifting and redistribution of media within the pad during operation (caused by wetting and drying cycles, air flow variations, and debris) results in channeling, hotspots, and reduced cooling performance. Pad Clogging Loading of the pads with dust and foreign material results in restricted and blocked air passage with associated channeling, hotspots, and reduced cooling performance. Pad Scaling Non-uniform water distribution or air channeling caused uneven water evaporation and hotspots that result in scale formation and rapid performance degradation. Moldy Pad Odor The variation in pad density causes some areas to retain moisture for periods long enough to support mold growth. Almost all drip coolers manufactured up to the 1960s featured excelsior pads made of aspen wood. Other woods were tried along with fiberglass and woven paper but each was found to have weaknesses that outweighed their advantages. Aspen pads continue to be sold today as a low-cost, limited-benefit cooling option. In the 1960s, Munters introduced rigid media bonded with special glues and consisting of either glass-fiber materials or thin corrugated sheets of strong cellulose (paper) impregnated with chemicals to resist sagging and decay. Rigid media could maintain its shape and support its own weight when wet. 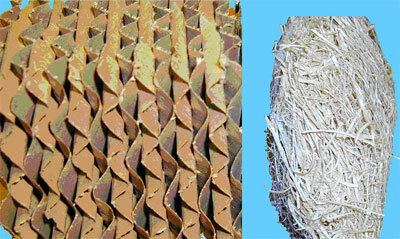 The photo below shows a sample section of rigid media on the left and aspen pad on the right. As one can see by comparing the open voids and corrugations of the rigid media with the randomly oriented, closely nestled fibers in the aspen pad, the two types have significant differences in both water and air distribution and resistance to air flow. Aspen pads prevent uniform air and water flow causing the evaporation rate and cooling effectiveness to vary across the pad. It requires more power to pull or push air through the aspen pads than through rigid pads due to the torturous path air must travel. Wetting the thicker rigid media pads required a shift from multiple tube "spider" drip systems (used in swamp coolers) to top-mounted pipes with evenly spaced holes and higher recirculating flows. The angles of the corrugations in the rigid media were patented by Munters to achieve effective air and water interaction in the channels, which promotes water evaporation while limiting the air-induced migration of water to the back of the pad that creates dry spots on the face of the pad. Water collection and storage sump must be located in the cooler under the media, which limits the options for cooler size and location and requires additional structural support due to the additional weight of the cooler. The sump water level must be maintained and cooler manufacturers typically select low-cost, unreliable, and high maintenance float switches similar to those found in the household toilet to serve this function. The higher recirculation flow rate increases the volume of water at the air to water interface, which increases the tendency for water entrainment and carry over at lower air velocities. The higher water flow rate creates a water blanket, which limits heat transfer and water vapor migration. The higher water flow rate and constant immersion of the media in water reduce the effective life of the media by wash the rigidifying agents from the media at an accelerated rate. Draining the sump at startup and shutdown takes significantly longer. Not draining the sump in that sequence creates stagnant water that supports the growth of algae and mold. These molds are not only unhealthy but are typically accompanied by a stale odor. No provisions are incorporated in recirculation systems to remove the foreign material that washes out of the air and into the sump. Therefore, this material either stays in the sump or is recirculated and deposited on the media. Re-depositing the material on the media reduces heat transfer and increases the rate of scale formation. Many schemes have been instituted to set and control the water bleed rate for recirculating coolers in an attempt to limit scale formation. The result achieved is that scaling continues to be a significant problem and water usage is high. A few companies have offered once-through systems as an alternative to the recirculating water system. These once-through systems have benefits over the recirculating systems, however only AZFlow has solved the water distribution issue and has an analog or continuous control for the full range of possible temperatures and relative humidity. Unlike AZFlow, these cooler systems use more water than the recirculating systems, have a shorter media life, and experience poorer cooling performance.